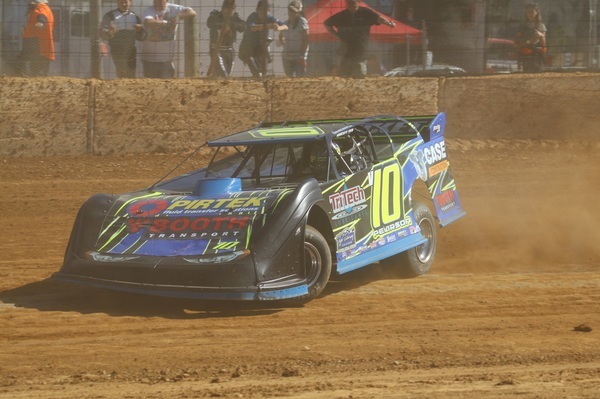 The Late Model Sedans and the annual Sports Sedan features headlined the action at Alexandra Speedway on Saturday 17 November, with Cameron Pearson from Healesville and Damien Miller from Pakenham taking out the respective feature race wins. The Late Model Sedans, buoyed by last seasons all-time speed record set on the track by Pearson, were keen to do it all over again. But the track conditions were not conducive to the times witnessed last season, with Pearson almost two seconds off that pace, yet still the dominating driver on race night. Pearson won the first of two qualifiers, with all eight starters finishing the race, with Shane Belk doing the same in the second qualifier. The shortened feature event, due to race incident and in part due to car count, finished with Pearson the winner by almost six seconds from Brock Edwards and Chevy Edwards, both from Eildon. Belk was in fourth from James Cornfoot, who has already been a winner this season, Kristin Vermeulen and Will Lamb. Sports Sedans had nine heat races to compete in before their final, with each driver scheduled to appear in three each. Local Luke Fallon won the first to start his night in great fashion, before Brendan Miller, Damien Miller, Dale Morrison, Shane Kruger, Jack Van Bremen, and Kruger again, Steve Kershaw and Brendan Miller took wins in the other qualifying races. From the second row in the feature race, Damien Miller rocketed through to the lead with his brother Brendan in second. Fallon by lap four positioned himself in third place and from there those three held position all the way through, with Kershaw in fourth place and Van Bremen finishing in fifth. In the Junior Sedan racing, starting with the national division, All Star class wins were shared in qualifying racing by brother and sister Rhys and Courtney Meakins. Rhys won the first heat and Courtney the next two before she also won the final. Rhys Meakins led the early part of the feature event right up to lap five before his big sister took the lead. The siblings swapped positions again on lap six and then again on lap eight before Courtney took the win from Rhys by just over a second. Jeremy Gorski was in third, followed by Chloe Sheerman and Bree Simpson. In the national division New Stars class, Luke Cornfoot and Linken Patterson shared the victories in qualifying with two race wins each, before Patterson won by a huge seven seconds in the feature event from Cornfoot, Kiarna Barton, Dillon Taylor and Jordan Pegg, the latter two rookies drivers in their first ever Junior Sedan race event. State Junior sedan action was a great three-way battle during the night involving Ally Morrison, Courtney Meakins and Nick Cherry, with the girls getting the better of Nick as Morrison took the points-determined win with Meakins in second. Closing out all the results, the Standard Saloon class was almost totally dominated by Russell Hill. He won heat one and finished in front in heat two before being penalised by the stewards for an indiscretion, handing the win to Aaron Meakins. Hill bounced back to win heat three and then the final, where he defeated Meakins, Cory Horter, Johnny Ravet and Darryl Wicks. Alexandra Speedway returns with club show racing on 1 December.